Retelling something as familiar as a fairy tale can be a risky proposition. In some cases, magic can come out of the details as an author elaborates on a classic. For instance, I happen to love Robin McKinley’s book Beauty, a take on the old tale “Beauty and the Beast.” On the other hand, when she re-told the story again twenty years later in Rose Daughter, I didn’t care for it at all. 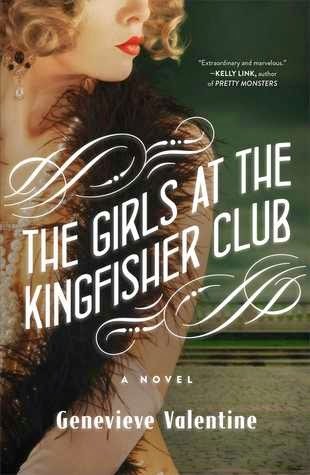 So I brought few expectations to my reading of The Girls at the Kingfisher Club, a retelling of the fairy tale “The Twelve Dancing Princesses.” To my delight, I found a creative, emotionally complex story that takes the original in an empowering direction. In most versions of the fairytale “The Twelve Dancing Princesses” (a German version is titled “The Worn-Out Shoes“), the story focuses on a challenge to discover why a king’s twelve daughters wake up in the morning with holes in their shoes (one version here). The king is baffled and frustrated, and offers a reward to anyone who can solve the mystery–but if not, then off with his head. Many have been died after falling asleep during their watch. Before accepting the challenge, a soldier meets an old woman who gives him a magic cloak and warns him not to drink anything from the princesses. After the soldier pretends to fall asleep, the princesses dress, go through a secret passage to an underground lake, row across and through a forest of metallic trees, and spend the night dancing with princes at a ball. As they return, the invisible soldier breaks off a piece of a tree, first silver, then gold. On the last night, he steals a goblet from the ball as proof. When the king demands an accounting, the soldier provides the proof and is rewarded by marrying one of the princesses. Clearly, the origin story is a complex bit of fairy tale, with princesses that are complicit in the deception, a father who is outside it but cruel with his consequences, and a ordinary man using magical gifts to catch the princesses in their dishonesty. Girls versus their father, a common man versus princes, and duplicity all around. Valentine takes these elements and heads into a very interesting direction. Twelve girls are growing up in a wealthy but isolated household in early Prohibition New York. Rarely permitted outside, or even invited to the downstairs levels of the house to visit their mother, they are ruled by their father in an extremely circumscribed life. Jo, the oldest, has met her mother only a handful of times, and the youngest haven’t met her mother at all. It falls to Jo as the oldest to negotiate on behalf of the sisters with her father. Told in third person limited, largely from Jo’s point of view, Jo ponders her nickname “The General,” arising from the unenviable position as enforcer/mitagator of her father, but yet attempting to protect them against his rage. Unfortunately, her efforts are often underappreciated. Trouble begins on two fronts when their father decides to actively intrude in their lives. As he schemes to marry the girls off, he gets wind of stories about a bevy of girls dancing at local speakeasies. An ad in the newspaper strikes fear in Jo as soon as she learns of his plans. The last section follows the girls as they discover life outside their father’s house. I rather enjoyed that Valentine took her story a step beyond the simple “they escaped and they all lived happily ever after,” and looked at the challenges of making a life, and how different the idea of success could be for each sister. As in all fairy tales, characters exist largely as archetypes. With twelve sisters, it’s hard to achieve a great deal of individuality with each, but Valentine succeeds with a few, particularly Jo, Lou (the second oldest), and Doris (the sensible one). I thought Jo’s emotional dilemma was well done. The father is perfect; elegant, controlling, and all implied threat. The setting of New York during Prohibition was nicely done. I’ve read a number of books that were quite enamored of the 1920s, but focused on the setting at the expense of character. Valentine achieves a nice balance between the magic of the clubs and plotting. My chief complaint was a writing style that felt awkward. Additional thoughts and commentary were often given in parenthesis, and the purpose/voice weren’t always clear. Nonetheless, I enjoyed the way Valentine’s tone and word choice was able to capture the emotional magic of a fairy tale but incorporate it into a real-world setting. Overall, I’d call it a delightful improvement on the original tale. I’d highly recommend it to fans of fairy-tales, sister bonds, coming of age stories and gentle romance. Thanks to NetGalley and Atria books for providing me an advance ereader copy. Quotes are taken from a galley copy and are subject to change in the published edition. Still, I think it gives a flavor of the magical writing.